Through rhythm we perceive the multiplicity of time. At least two scales, in a constant and unending dialogue, create a rhythm that elicits an elated and dilated sense of time. The dance mentioned by Doris Lessing in Briefing for a Descent into Hell, the novel about the hallucinated journey made by a wayfarer who has gone mad, is a tale of multiple rhythms. As the narration unfolds, the heading below the main title of the book –Briefing for a Descent into Hell. Category: Inner space fiction, for there is never anywhere to go but in- becomes clearer. The main character tells the incredible story of a journey, while sitting in the bed of a sanitarium, with flashbacks and flashforwards that confuse and mock on purpose reader’s sense of time. Stephan Thelen, who named the initial track of his album Fractal Guitar after this novel, plays time in a similar manner. Overlapping metrics create a fractal tapestry of wicked intersections, covering layers over layers of rhythmic figures that collide. Like the wayfarer in the book, he navigates through constantly rippling soundscapes made of repetitive patterns and dense energy that create a sense of dreamlike awakening. The Zürich based and American born guitarist and mathematician spent the last decade in breeding his project Sonar together with Bernhard Wagner, Christian Kuntner and Manuel Pasquinelli. The Swiss band reached a peak of critical acclaim with last year’s Vortex and Live at Moods, which both hosted David Torn as a ﬁfth band member. Their trademark sound made of tritone-tuned clean guitars knotting over polyrhythmic hypnotic structures was added, better to say enhanced with the ‘+1’ member, who combined their sound with his unique swirling soundscaping palette of sounds. This resulted in opening a new landscape of possibilities, better to say an exponentially growing map of new explorations to embark on. His inﬂuence is infectious because he has such a great live energy –Stephan Thelen stresses. While the band will meet again later this year to record again with the same four-plus-one line-up, Thelen asked the American guitarist to play on his solo album Fractal Guitar, released on Leonardo Pavkovic‘s label MoonJune. This time the list of guests was enriched with multiple musicians, making it like a testament of the currently most highly regarded avantgarde guitar players. The list was not prearranged, it eventually grew as the project evolved: I knew from the start that I wanted to have Markus Reuter on the album because we had talked before about doing something together –says Thelen. I had some pieces I knew they were not ideal for Sonar and I wanted to ask Benno Kaiser to play drums on them. So Markus, Benno and myself, we were the core trio of this project. Stephan Thelen worked with touch guitarist Markus Reuter on Falling for Ascension, cobilled to Reuter himself and Sonar. Looking in retrospect, it is quite interesting to look at different directions the band took with Reuter and then with Torn as additional member. But while Falling for Ascension presented music written only by Reuter, this time they were looking at something composed by Stephan Thelen. It all started with drummer Benno Kaiser -yet another former collaborator with Thelen, they played together in Radio Osaka and on several solo works by the guitarist – providing drums on two tracks and the three of them sending each other their outcomes via internet. It was August 2015 when they started after Stephan Thelen had just come back from a trip to Namibia (by coincidence he was heading off to same country again at the end of the recording process in July 2018). When Benno could no longer continue with the project, I asked my Sonar buddy Manuel to record the remaining drum tracks, knowing that he could nail them down perfectly. Then I went to California, where I met Henry Kaiser and Bill Walker and recorded their tracks in Santa Cruz –recounts Stephan Thelen. I knew Jon Durant from Facebook. He sent me one of his albums and I thought it would be great if he could contribute. I had also met Barry Cleveland in California where I asked him to add some of his sounds on two tracks. It was all very spontaneous and the list of musicians just kept growing. Henry Kaiser was pivotal for Thelen to meet David Torn, who joined a Sonar recording project at the start with the idea to produce the album and ended up playing on all of what then became Vortex. When I was almost ﬁnished I knew David was coming to Switzerland and thought of two pieces he could play on. So we booked a studio for a day and recorded his solos and loops. Finally, Matt Tate added all his tracks in Chicago on one evening. The very last thing that was recorded just before the mixing sessions started was Andi Pupato’s percussion on the title track. Driven by a steady riff by touch guitar, Briefing for a Descent into Hell is built around 3 + 3 + 3 pattern, that Thelen eventually superimposes with polyrhythmic patterns in 5 or other odd measures. Still the track maintains an even mood that feels like a suspended flight over the top of a mountain. While the initial couple of minutes see a multiplication of alternating patterns and riffs that create the intro mood, still there is no lead theme, only the augmentation and fractalization of the main pattern. David Torn enters with occasional sharp and distorted sounds on the higher register, but he highlights the role of soundscape on the bottom more than singing the main melody. The tension grows and gets altered by lots of delays, dialoguing with rhythmic section by Matt Tate at touch guitar and Sonar‘s Manuel Pasquinelli at drums. At around eight minutes and thirty the first stop leaves a few seconds available for a horn-like soundscape to become more visible, until the very first thematic solo of the record is made by Markus Reuter. The second stop, that falls immediately at the end, reveals an odd-signature riff in the style of King Crimson‘s Frame by Frame. Stephan Thelen, who studied in Robert Fripp‘s Guitar Craft Circle and he makes no mystery of his reverence for King Crimson‘s knotty works such as Fracture, has been hugely influenced by the British master. While Sonar showed his clean-guitar side, more related to the ’80s King Crimson line-up, on the other hand he explored lead guitar effects in his earlier career and also soundscapes that owe a lot to the works Fripp made solo and with the King Crimson. Here it’s like he is finding a balance between two souls of himself. And coming back to the track, it’s again David Torn taking the reins of the song, putting everything back in a frenzied, yet steady state. Stephan Thelen remembers some details about Torn‘s recording session: I asked David to really ‘squeeze the neck’ like a blues guitarist on this one and even played him David Gilmour’s solo from ‘Echoes’ as a possible source of inspiration. He eventually received the message loud and clear and here he adds an overwhelming formless magma of sounds, distorted chords, growling sounds that increase, until finale slowly shrinks with loops and soundscapes. The first thing to compare Fractal Guitar with might easily be previous recordings by Sonar, for which the guitarist is the main composer as for his solo album. It is very different, if I am composing for Sonar, I know there will be no solos and no lead voice –he says. I am concerned with interplay and how the piece evolves. What I am interested now is a combination of writing and improvisation. It’s not completely improvisation and composed, it’s a mixture. There’s a lot more of that on ‘Fractal Guitar’, I wanted more solos, more that the individual musicians could have fun doing wild and daring things. Sonar is more organized, although it can and does get wild sometimes. While the band is proceeding more within a restricted set of self-imposed rules operating at moment of writing the music, which thing is part of their creative success, this time Stephan Thelen decided to steer in a different direction. If you write with a limited set of rules, it’s actually sometimes easier to get new ideas. If I am working with Sonar, I stick to those rules. It’s not ‘forbidden’ to write in 4/4 time, but rhythmically it will be more complex than that. For my solo album, the music is more textural. I am thinking what kind of sounds to use and which players could adapt to those sounds. For example, if I know I will be playing with Markus, I can write specifically for him. This time he is allowing himself to extend the effects to include delay and compression, effects that are so unusual in the usually dry-of-any-addition sound of Sonar. I used to play a lot with effects, 10 years ago -says Thelen. But coincidentally with Sonar, I concentrated on a pure and clean sound to focus more on composition and clear structures. For many years I just put effects away, but then I spoke with Markus and saw what he did with effects and loops. He is still bending them to serve same purposes of repetition he explores with his own band. I especially wanted to use an effect I worked with before Sonar, which I call ‘Fractal Guitar’ -a rhytmic delay with a very high feedback level that creates cascading delay patterns in odd time signatures such as 3/8, 5/8 or 7/8 -as he writes in the lines notes. 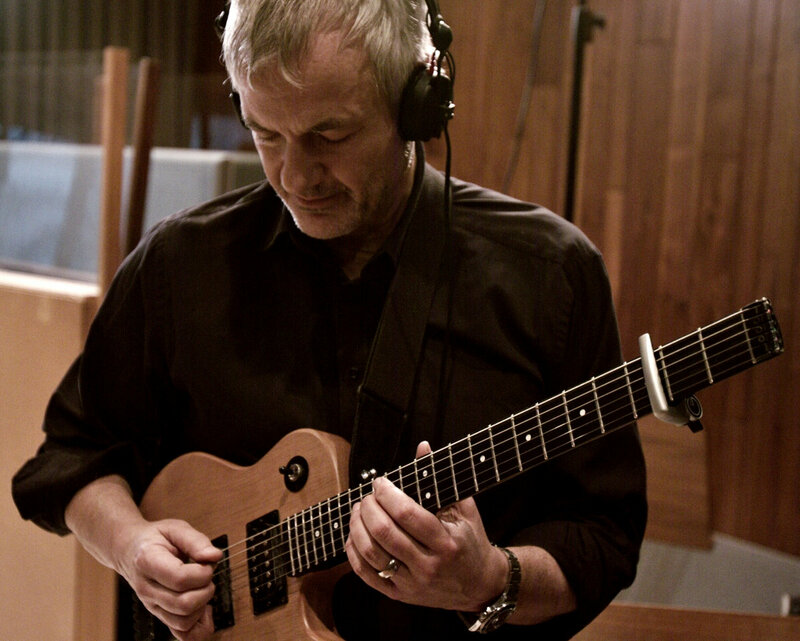 While working with extended delay techniques has allowed guitar players to play by themselves alone, but has also forced them to stick to the expectedness of the 4/4 beat -take the 1975 manifesto of delay explorations made by Manuel Göttsching Inventions for Electric Guitar as an example, here Stephan Thelen plays with the machines in a different manner. Before Sonar I was playing with short delay that keeps going for a long time, those fractal like patterns. I used mainly delays, but I had also some samples and a granular synthesizer. The eponymous track Fractal Guitar starts with the Swiss guitarist playing against himself and setting the delay’s feedback to add unexpected odd patterns to the beat. This track most clearly demonstrates the “Fractal Guitar” technique. Here, the delay on the guitar is set so that a 5-note pattern is produced. That is set against a 9/8 pattern played by the rhythm section -as Thelen indicates in the track notes. Matt Tate‘s theme in the bass register is volatile and ambiguous and Benno Kaiser keeps two differently signed patterns in loop until accelerating at around three minutes and half. This pushes Markus Reuter forward to play a lacerated solo, followed, almost by contrast, by another one, this time made of very basic, yet thrilling, riff. But this is just momentary until the mood reverts to a quiet status, that allows Thelen to continue exploring colliding patterns. Variation and exploring, it’s a philosophical thing. If you can’t accept repetition, you won’t like this music. When discussing about the nature of rhythm, the semiotician Algirdas Greimas made a difference, between ‘simple expectation’ and ‘trusted expectation’. Even though he investigated rhythm in a broader sense, even outside the realm of music, the ‘simple expectation’ can be applied to what happens in a rhythmic cell when the beat alternates between sound and silence. This creates an energetic curve in the listening: we might think about the feeling of waiting, of expecting the next beat in a pattern. ‘Trusted expectation’, instead, plays in a different manner. The listener ‘believes’ (s)he can trust on the beat, can anticipate what the rhythm is producing, not only waiting for the next to come. This expectation plays on an higher level, creating a bond, a semiotic contractual agreement; the listener is part of the playing music. Roughly speaking, it does not play at rhythmic cell level, but at overall track/listening experience level. If this agreement is maintained -which might be translated with ‘if the listener perceives no break in the rhythm’- then the listener feels a sense of pleasure. Interestingly Thelen completely fits and at same time definitively disavows this definition. His patterns are repeating and each track in Fractal Guitar originates from a single pattern, exploding around it in a geometrical manner, like the picture of a fractal. This should maintain steady the perception of the rhythm. But, nevertheless, he is playing with the unexpected through a net of invisibly colliding patterns, that create a sense of permanent surprise in the listener. This allows a bond to be created, the listener to enter a feeling of deep listening, while still keeping a sense of focus and exploration. I know lot of musicians who categorically think that something which is repeated more than two or three times can not be good music -says Thelen. Variation and exploring, it’s a philosophical thing. If you can’t accept repetition, you won’t like this music. For me it was always clear: I love repetition and things that go on and on and on. By repeating something you create a sonic landscape or an atmosphere, so then you can concentrate on doing something on top of this landscape. Repetition is essential to create rhythm and it has been hugely embodied by ritual music. Keeping a continuous pattern going on allows the listener to uplift the focus from everyday things, to move to a ‘flow’ phase. This has been often linked with what happens in trance. I always liked this kind of trance music –Thelen says, but it was never related with losing attention. It’s connected with the fact that you have a different set of mind, but not a set of mind you are not aware of. It has to do with being very attentive. Trance might sound like losing mind: if I listen to Steve Reich there are repeated things, but on the other hand I can feel every repetition in a different manner. It’s not like being spaced out, it’s not drug related. It’s the contrary, it’s being very perceptive, because of the small things that can change. It’s trance, but it’s trance with awareness. The intersection of convoluted patterns and a wicked soundscape enriched with augmented and diminished notes at the start of Urban Nightscape puts the listener into a deep state of amplified awareness. The main theme of the track was originally written in 2003. This has then been released in various different versions, including on Thelen‘s 2008 solo String Geometry, which incidentally featured Benno Kaiser on drums as in the latest version. A bass pattern in 6 + 6 + 6 + 7 is added to a fast and ever-changing drum pattern, while the Fractal Guitar delay is in 5/8 -according to Stephan‘s notes again. The energy is at its highest when Torn adds his drilling, thumping, ripped guitar noises. David Torn is one of the most expressive guitarists, he can create such a dense emotional world -says the Swiss guitarist. We played with other good musicians, but hardly anybody that I know can be so experimental and the same time create that kind of emotion.. The interaction between the solos and the soundscapes by Markus Reuter reaches unparalleled levels of intensity, until coming back to the initial theme by Thelen and revealing the substance of it all, the rhythmic pattern that originated the entire track is based upon. Steve Reich deeply informed Stephan Thelen‘s approach to polyrhythmic patterns and repetition. While discussing the rhytmic approach of the minimalism master with Stephan, there’s one anecdote that is very interesting to quote. When Reich was once asked about Stravinsky, he pointed out that – compared with other conductors – he preferred the way the russian composer directed his own works. What is very interesting is that Reich enforces his argument by saying that, as a conductor, Stravinsky reaches the highest levels of emotion through an absolute control of time and pulse.. This interesting connection between absolute control of time and creating emotion might be reflected in Fractal Guitar: still Thelen goes beyond that. You have to be rhythmically 100% tight to release that emotion. I agree that rhythms must be played precisely –agrees Thelen. But on the other hand, for instance when we [Sonar] first played with David, there was a whole new world that he could bring to our music. We had our own rhythms of course, with which we could create emotional music, but if you have him on top that’s a new and different world of emotions. When I go to a concert I like to hear the ideas behind the actual music and how these ideas unfold and evolve over the course of time. Stephan Thelen has a priviliged view also on the Swiss postminimal scene, having been linked with zen funk pianist Nik Bärtsch and with saxophonist Don Li. The connections with minimalism and Steve Reich are obvious, but the guitarist interestingly comments about what is difference between that American minimalism and this Swiss postminimalism: I remember one thing that Nik Bärtsch told me, that for him Steve Reich’s music is about pulse, not about groove. Groove opens up a whole new world of emotions which you can’t achieve with pulse. In the case of Sonar, we like to play a rhythm for an extended time period and let it grow tighter and tighter, denser and denser. On Fractal Guitarhe applies a similar approach, discovering a world of emotion with Sonar as well in his solo album. Road Movie again originated from previous music material, as Thelen‘s notes tell the story behind the track: this was the ﬁrst track that Markus played on in December 2015. His magnificent solo was recorded in Berlin and is on the ﬁrst section of the piece. Manuel added his drumtracks in Benno’s studio in Aarau, Switzerland, on April 17, 2016. Bill and Henry added their tracks in Santa Cruz on April 27, 2016. Bill plays the solo in the middle section, Henry the solo at the end. Finally, Matt recorded his bass track on March 30, 2018 in Chicago. The main riff of the piece (an isorhythm in 27/8) was later used as the starting point for ‚Lookface!‘, a track from Sonar’s album Vortex. Creating tension that gradually shifts on and off through the various solos, until collapsing in a prolonged wall of sound finale, we feel the repetition increasing on and on until the emotion breaks at its highest point. In 2016 Thelen wrote Circular Lines, a piece commissioned for Fifty for the Future: The Kronos Learning Repertoire by Kronos Quartet. Writing for classical ensemble is not new for him, since his repertoire already featured previous works adapted -notably Works for Piano played by pianist Viviana Galli– or composed for instruments or ensembles. I am currently writing a percussion piece for vibraphones, marimbas and organ – he indicates. I also wrote another string quartet for a possible future string quartet album. The influence of mimimalism is always relevant in his writing process, still he explores it from a different perspective: while it’s practically impossible to write for vibraphones and marimbas without quoting Steve Reich, the addition of an organ creates new possibilities. Whether pushing the boundaries of his guitar with or without effects, composing intricate and hypnotic polyrhythmic pieces, thrilling soundscapes or writing for classical ensembles, he still retains his vision behind that. When I go to a concert I like to hear the ideas behind the actual music and how these ideas unfold and evolve over the course of time. In other words, I’m always interested in a process that is based on a good and interesting idea which is presented in a very clear and transparent way. The idea itself can be very simple, but it should have the potential to create complex and interesting results. With Sonar we often very slowly build up a piece where one instrument starts and then others join in. In that way, you can clearly hear the elements of the piece slowly coming together. That’s something I always enjoy.